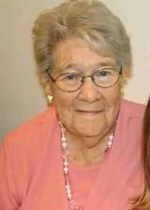 Dora Elizabeth (Delozier) Adams, 97, of Valley Lee, MD, passed away on February 2, 2019 at her home surrounded by her loving family. Dora was born on January 27, 1922 in Baltimore, MD, to Anthony and Nellie Delozier. Dora was the loving wife of the late Charles Henry Adams Sr., who preceded her in death on January 29, 1998. She is survived by 10 of her 12 children, Nancy (James) Schmidt of Aldie, VA, Barbara (Randy) McDonnell of Herndon, VA, Robert (Sandy) Adams of Valley Lee, MD, John (Chris) Adams of Drayden, MD, Patrick (Garnette) Adams of Ridge, MD, Michael (Betty) Adams & Daniel (Chantal) Adams, both of Valley Lee, MD, Sharon (Harvey) Yee of Chicago, IL, Annette Adams of Valley Lee, MD and Lisa (Kevin) Squires of California, MD. She was also blessed with 26 grandchildren, 32 great grandchildren, and 3 great-great grandchildren. Dora was preceded in death by two of her children, Charles Henry (Patricia) Adams Jr., and Mary Catherine (Luther) Edwards, as well as all five of her siblings. Dora was the oldest of six siblings. She grew up in Scotland and St. Mary’s City, MD. She graduated as the valedictorian from St. Michael’s High School in 1940. She married her husband on October 28, 1941 at St. George Roman Catholic Church, and raised their twelve children on their farm in Valley Lee. Dora was a lifelong member of St. George Catholic Church where she was involved in the Ladies of Charity and served as a Eucharistic minister and lector. After sending her last child to school in 1970, she started working in the cafeteria at Piney Point Elementary where she continued until 1983. Dora also volunteered at St. Mary’s Hospital as the front desk secretary until she retired at the age of 89. She loved to dance, play pitch, garden, cook/can, and travel. Some of her favorite trips were to Acapulco, Washington State, and Connecticut to visit her beloved sister-in-law, Sister Catherine Agnes Adams with the Sisters of St. Joseph. Her favorite pastime was to spend time with her abundant family. The family will receive friends on Thursday, February 7, 2019 from 6 PM to 8 PM with a prayer service at 7 PM at St. George Roman Catholic Church 19199 St. George's Church Road Valley Lee, MD. A Mass of Christian Burial will be celebrated on Friday, February 8, 2019 at 10:00 AM at St. George Roman Catholic Church in Valley Lee, MD with Father Paul Nguyen officiating. Pallbearers will be Charles Adams III, Nickolas Adams, Paul Lovett, Alex Jordan, Joshua Pebler, and Austin Samblanet. Memorial donations can be made to Hospice House in Callaway, MD or to the 2nd. Dist. Vol. Rescue Squad Valle Lee, MD. To send flowers to the family of Dora Elizabeth Adams, please visit our Heartfelt Sympathies Store.